Sweden will hold a general election on 9 September, alongside regional and municipal elections. 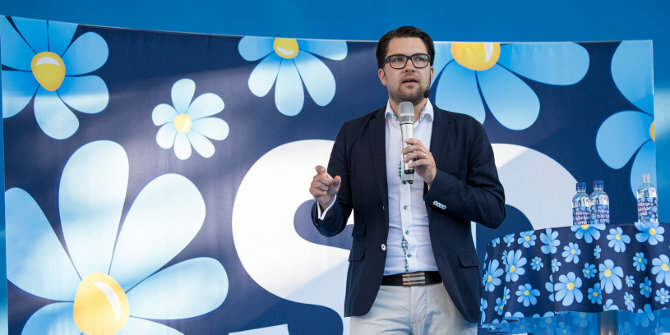 Anders Hellström assesses the campaign so far, which has focused to a large extent on support for the anti-immigration Sweden Democrats. He suggests that the framing of the campaign around the policies of the Sweden Democrats, coupled with the other parties’ lack of a positive, alternative vision for the country, goes some way toward explaining the current polling. Sweden is approaching its national election day, with the country’s general election taking place together with regional and municipal elections. And many commentators and mainstream party representatives are worried about the current electoral fortunes of the Swedish anti-immigration party, the Sweden Democrats (SD). The fear is that Sweden may now be on the trajectory of other countries in Europe which have elected large numbers of representatives from nationalist populist parties to parliament, and in some cases even into government. The narrative is that everything is going down the drain and there is no hope. However, there are several reasons not to jump to hasty conclusions. Sweden is not yet on an inevitable path toward dystopia. In the last general election in 2014, Swedish voters had two main alternatives on the issues of immigration and integration: either to vote for the Sweden Democrats or to select any other party. This divide between the SD and every other party is no longer apparent. The two traditional blocs (blue and red) are now displaying internal divisions over how to handle the immigration/integration issues, with different factions suggesting different measures. These divisions are mirrored in the electorate. One might deduce from the current picture that the debate on immigration is both highly emotional and polarised. Nobody would like to be a populist, but all politicians would like to be seen to represent the ‘people’ against ‘the elite’. Of course, we should remember that it is not always clear what the interests of the ‘people’ actually are. While it is important to acknowledge the gains that radical-right populist parties and authoritarian leaders across the world have made, considerable progress has also been made by the opponents of such parties – and these opponents include both prominent politicians and people on the ground. Yes, the Sweden Democrats are making headway and are almost attracting 20 per cent of the vote in the polling. But the Centre Party, representing a pro-immigration stance (together with the Liberal Party) may also enjoy an upturn in electoral fortunes as well. Voting behaviour is highly dependent on the political agenda. If immigration and law and order are viewed as key issues, then the Sweden Democrats have potential to mobilise more of their voters (even if campaigners argue against them). This was evident at the end of 2015 following the EU migration crisis. On the other hand, if the political debate is centred on the environment, it will almost certainly be to the benefit of the Green Party – a situation that occurred earlier this year when Sweden was hit by a drought and forest fires. Similarly, for the Social Democrats, focusing on traditional welfare issues and perhaps introducing notions of class to the political discussion would be a beneficial strategy that would leave little room for the Sweden Democrats. Sweden has not suddenly become an intolerant country and not all voters considering backing the Sweden Democrats are racist. In late-2015, Sweden took in large numbers of refugees escaping from countries like Syria. The capacity of individual municipalities was stretched. Many parents learned of their children experiencing conflicts at school, while people begging at the front of grocery stores became a common sight. Perhaps some parents are even now afraid to let their sons and daughters out at night. Community cohesion and a sense of belonging appear distant memories. Yet Sweden is, by some standards, doing quite well. Granted, there are real environmental issues facing the country, but the unemployment rate is going down and the economy is improving, even if the demographic composition looks different in 2018 compared to 1958. Politicians, however, have fully embraced the image of a country in decay and have presented their visions for the future from this starting point. Mirroring the Sweden Democrats, the other parties assert that more police officers are needed to combat escalating crime rates in the suburbs. If a party attempts to launch its own proposals, the tendency now in the media is to almost immediately relate this to the SD’s policy. If a party takes a harsh line on immigration or law and justice, this simply serves to normalise the approach of the Sweden Democrats. And voters, as we know, will prefer to vote for the original and not the copy if given the choice. The Sweden Democrats put forward a nostalgic vision of a Sweden that was better off before, but there is currently an absence of alternative visions from the other parties that can capture the imagination of voters. To regard a large proportion of voters as merely being racist or intolerant is to overlook that they may simply be tired of politicians explaining to them that they are wrong; that their own experiences do not matter or are merely a symptom of backwardness. This again overlooks that even if Sweden appears to be doing very well from a top-down perspective, an individual’s own situation might not have improved. How citizens acquire their information has also changed in the face of new technology. The growth of social media, for instance, has played an important role. Perhaps in previous decades citizens were less exposed to news about crime, given they primarily relied on local newspapers as a source of information. Today, one can read about crime almost everywhere on social media on a constant basis. It is hardly surprising therefore that many citizens believe the country is on a downward trend. Even those who are aware of the dangers of ‘fake news’ may still be more likely to choose sources of information that match their partisan preferences. Politicians stating macro-level facts and statistics cannot alter this perception. Regardless of the upcoming election result, Sweden in 2018 undoubtedly appears a more exciting and prosperous place than it was sixty years ago. However, the way out of a tragedy is not to stop dreaming, but rather to dream more. Anders Hellström is an Associate Professor in Political Science in the Institute for Studies of Migration, Diversity, and Welfare at Malmö University. He is the author of Trust Us: Reproducing the Nation and the Scandinavian Nationalist Populist Parties (Berghahn Books, 2016).